Alexandra Gagnon Teen Center was created through the efforts of The Alexandra Gagnon Foundation to provide safe, enlightening, educational, and entertaining experiences for teens on Martha’s Vineyard. Our permanent facility is 5,000 sq. feet spanning two floors, with program activity rooms, a kitchen and performing arts space. 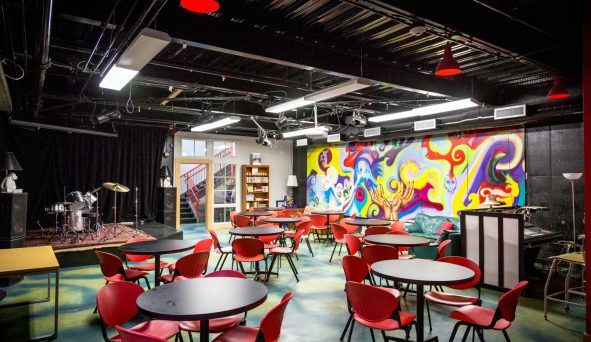 The Base at Alex’s Place is our performing arts space and includes a stage, sound system, professional stage lighting, seats 70, and Studio 57, sponsored by Comcast. An 8 week workshop, where teens learn about the world of cartoons, comics, and illustration. As a class the workshop will look at famous cartoonist and illustrators work for influences to better their artistic abilities. Some materials will be provided. A one-week intensive music and performance program from July 30th-August 3rd. Teens will learn about singing, songwriting, performing and recording. The program features top performers from around the island and the country. A casual mentor program for teen males in the community. 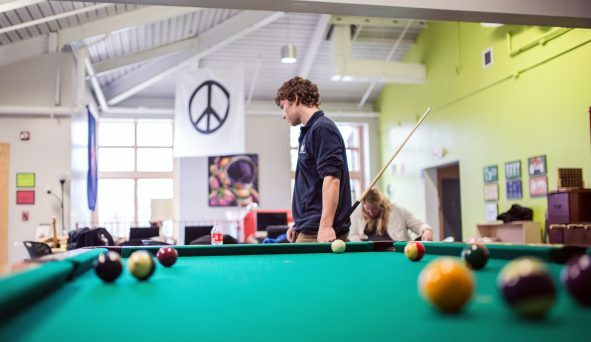 Utilize the teen center and connect with male professionals who can help you think about your futures after high school. Once a month a teen band performs at Alex’s Place for their peers and the community. Come get some free comic books, hang out with your friends and enter a raffle to win comic book packages. Come hear some amazingly talent Teens from Alex’s Places. Tuesdays during July and August at the Aquinnah Library. Come hang out with your friends and watch your favorite anime. An opportunity for 6th, 7th, 8th graders to come and hang out with friends, dance, play video games, play pool and eat free food. Meets once monthly on Friday night, check Facebook for dates. Interested in learning more about the teen center and coming up with great ideas of things to do? Join the leadership Council! Meets bi-weekly at MVRHS during Flex period. Come take your skills to the limit. Singles and doubles tournaments. Hosted by SMASH MV in coordination with Alex’s place. Meets once monthly on Saturday, check Facebook for dates. Alex’s Place is available to the entire community for rent, use our full kitchen, a downstairs space that has a stage, sound system, stage lighting and space to fit up to 70 people. Both floors are open, need a space with a projector we have one, looking for a place to do a theatrical or music performance we have that too. "The program at the Y that has greatly impacted me is the Teen Center, I met my greatest friend Indigo there. The Y has helped me become a well-rounded and good person." “Just look at the Teen Center, a safe haven for all teens on the island."